By Way of Introduction – Welcome to our Connections! It was in the European cultural capitals of the first half of the twentieth century that “the music was playing” in the truest sense of the word. Places in which connections were established; and these ties across the borders of nationalities, schools, and styles enriched a musical life that tolerated almost everything, made many things possible, and allowed many an idea to come to fruition. On the one side stood the awakening national self-awareness, a political altercation fought between revisionism and social, if not to say socialistic change; on the other side, the shattering of the borders of tonality, of harmonic functionality, and of the guide rails of the Classical-Romantic formal canon let the strongholds of the until then still linearly flowing musical history tremble. Connections – people met one another, the musical ideas of the last offshoots of tradition and rampantly proliferating modernism collided with one another and gave birth to grandiose things on both sides. Vienna, the first station of our “Connections” series, was one of the often described hot spots of this era. The present recording impressively documents what a diversity of compositional expression could exist side by side at the highest level, and pays tribute to the composers’ courage and the way they saw themselves, even if they were at that time – from today’s viewpoint – looking back over their shoulders or with the telescope far into the future. In the 1920s Hans Gál was one of Austria’s best-known composers; his stylistic balancing act between Viennese elegance, the still tonal exploitation of the palette of late Romanticism, and the perfect mastery of classical compositional techniques is today experiencing a late, indeed an overdue renaissance. The slow movement of Ernst Krˇenek’s Violin Sonata op. 3 opens to the listener a powerful musical universe, logical in itself, that in its wealth of musical ideas points directly to the roots of the creativity of this citizen of the twentieth century, and simultaneously looks ahead to the cornucopia of his creative fountain, which was to run dry only many decades later. In Egon Kornauth, finally, the late-Romantic influence unmistakably presents itself, and he convinces with his melodic voice leading and the joy with which he exploits the classical formal idioms. Everything under one umbrella – in a word: connections, established in an epoch in which the determinism of the postwar era had not yet arrived, and one could still write for the sake of the art. Even in difficult times it was first and foremost Vienna that carried forth in Europe this exciting mixture of lightness and melancholy fed by the obsession of its protagonists. Let yourself be carried off by the works from the musical cosmos of the city of Vienna. The works we selected deserve your attention and that of the musical public. The subsequent CDs of this anthology will be devoted to other cities and to the connections that the great composers of the time entered into within their boundaries. We cordially invite you to accompany us. Hans Gál was born near Vienna in 1890, son of a Jewish doctor, and grew up in the world of that turn-of-the century imperial capital. He was fortunate enough to study with some of the foremost teachers of the time: the pianist Richard Robert, (whose pupils included Rudolf Serkin, Georg Szell and Clara Haskil), the eminent music historian, Guido Adler, and composition with Eusebius Mandyczewski, who had been a close friend of Brahms and became something of a ‘spiritual father’ to Gál. In 1915 he won the Austrian State Prize for Composition. The First World War, which left Austria politically and economically in ruins, marks a decisive break in his career, but during the 1920s his reputation grew rapidly, notably with his second opera, Die Heilige Ente, which was so decisively successful at its first performance in 1923, under Georg Szell, that it was immediately taken up by a further six opera houses for the subsequent season, and was still in the repertoire in 1933. Following these and other successes, particularly in Germany, Gál was appointed Director of the Conservatoire in Mainz in 1929. The next four years marked the happiest and most intensely active period of his life. But the Nazi Machtergreifung in March 1933 brought instant dismissal from office and a ban on all publication and performance in Germany. He returned to Vienna, but the political situation in Austria became increasingly precarious, and when Hitler marched into the country in March 1938, Gál and his family immediately fled to England, with the intention of emigrating to America. A meeting with Donald Francis Tovey, Professor of Music at the University of Edinburgh, brought some welcome temporary employment in Edinburgh, where the family eventually settled at the outbreak of the Second World War. But Whitsun 1940 brought the next blow: internment as an ‘enemy alien’; and it was not until 1945 that he finally obtained an appointment as lecturer in music at Edinburgh University. He remained in Edinburgh until his death in 1987, creative as a composer well into his nineties. But in the totally changed musical climate after the Second World War, Gál never re-established his former position, and became better-known as a scholar and teacher – he wrote books on Brahms, Schubert, Schumann, Wagner and Verdi – than as a composer. Recent years, however, have seen a growing number of major recordings, including the Complete works for Solo Piano and Complete String Quartets, both of which span virtually the whole of the composer’s creative life. Hans Gál’s compositions include four operas, four symphonies, large-scale cantatas, and a host of chamber, piano and vocal works. By the end of his long life, he had left a legacy of around 140 published works. Although more than half of these were composed in Britain, his work, and indeed his whole cultural identity, remained deeply rooted in the Austro-German tradition. His style draws on many different strands of that tradition: the clarity, wit and formal mastery of the eighteenth century Viennese classics, romantic intensity combined with emotional restraint, a Schubertian love of melody, integrated with a polyphonic texture that derived from a lifelong engagement with the works of J. S. Bach, as well as the harmonic complexity and advanced tonality of early 20th century pre-serial modernism. Gál never doubted the continuing validity of tonality, nor the potential for saying something new within that medium. This is clearly evident in the vitality and range of his oeuvre. 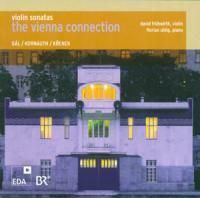 The Violin Sonata stems from the start of the most intensively productive decade of Gál’s life, including his second and third operas, Die Heilige Ente and Das Lied der Nacht; his First Symphony and the much-performed Overture to a Puppet Play; the Piano Sonata and Organ Toccata; the Piano Trio and Second String Quartet; the Wind Divertimento, as well as a host of choral works. These works from the twenties are immensely varied, powerful in conception, outward-looking, encompassing a seemingly endless flow of invention and creative energy. Gál’s musical style, whilst always retaining clearly recognisable features, shows certain phases of development. The Violin Sonata, composed in 1920 for the virtuoso Robert Pollak, clearly belongs to his most outwardly expressive compositional phase of the 1920s. The work, although a sonata, reflects in many ways the scale of the compositions of this time, ‘operatic’ in terms of the grandeur and generosity of its melodic and harmonic structure – indeed, there are echoes of Die Heilige Ente (composed 1920/21) throughout in its richly chromatic chordal progressions, none more striking than in the opening introduction. Tonal expansiveness is achieved also through the use of parallel progressions to shape the melody, fleetingly suggesting distant key relationships along the way. This is further reinforced by the apparently simple melodic lines which, on closer inspection, contain highly complex chromatic twists and turns. The first movement, despite the rhapsodic, improvisatory quality of its opening, is in clear sonata form, the first subject in the romantically charged key of B flat minor contrasting with a much more tranquil second subject in D major. The underlying syncopated motif, however, gives unity to the whole movement. The second movement is a somewhat eerie scherzo, alternating between a rhythmically quirky, off-beat first section and a more cantabile section, both of which recur in different guises. The final movement, a molto espressivo adagio, has close thematic links with the first, and indeed finally returns to the B flat minor opening bars of the Sonata, just before allowing the adagio theme the last word, in the relative major key. The opposition between dark and light that is played out throughout the work has been resolved in light. The name of Egon Kornauth is now largely forgotten – a loss to today’s listeners, since his worklist contains a generous number of compositions in an appealing late-Romantic style. Kornauth was born in 1891 in Olmütz (then in the Austro-Hungarian Empire, and now Olomouc, in the eastern part of the Czech Republic). He revealed all-round musicianship in his early years: his public debut as a pianist was made at fifteen, he played the organ in his local church and performed as a cellist in an amateur string quartet as well as professionally in the theatre and symphony orchestra in Brno. A move to Vienna in 1909 brought him to the Academy of Music under the tutelage of Robert Fuchs, the list of whose students reads like a roll-call of the great and good of the next generation: it includes Mahler, Sibelius, Franz Schmidt, Schreker, Wolf and Zemlinsky. His next teacher, Franz Schreker, a former Fuchs student himself, was also responsible for a raft of gifted composers, among them Julius Bürger, Alois Hába, Jascha Horenstein, Ernst Křenek and Karol Rathaus. Kornauth completed his trilogy of major teachers when, finding Schreker’s preference for operatic composition irksome, he moved on to Franz Schmidt. Cream on the pedagogical cake came at the University of Vienna, where he studied musicology with the revered Guido Adler, the very founder of the discipline. His doctorate, gained in 1915, was on Haydn’s late quartets – indicating an interest in chamber music that was to dominate his own output. Success soon came to Kornauth early, both as a performer and composer: in 1910 he made a concert tour of the USA as accompanist of the Vienna Gesangverein – a modest first sign of his openness to adventure – and in 1913 his Viola Sonata, Op. 3, was awarded the Austrian Staatspreis. In 1916 he took up a position of ‘Solokorrepetitor’ at the Hofoper and soon began teaching theory at the University, his career as a teacher in Vienna evolving alongside his growing reputation as pianist and conductor throughout Europe and further afield. Much further afield, in fact: in 1926 he was asked to organise an orchestra in Medan, the capital of northern Sumatra, and conducted it for two seasons. Thereafter (1928–29) as pianist of the Vienna Trio, which he had founded, he toured Java, Celebes and Ceylon and, later (1934–36), South America and Scandinavia, as well as elsewhere in Europe. Back in Austria Kornauth’s career advanced in a succession of prizes: having won the prize of the Gustav Mahler Stiftung in 1919 and the Salzburg Chamber-Music Prize in 1922, in 1929 he won the ‘Kunstpreis’ of Vienna and in 1939 he obtained first place in a competition organised by the Konzerthausgesellschaft. After the Anschluss, with the Nazis now in power, Kornauth found himself in a delicate position: his accessible, lyrical music appealed to the authorities, as it did to concert audiences in general: at least in Vienna, Kornauth was one of the most widely performed composers of his day, which made him an especially prominent figure. He managed to tread a delicate tightrope: he joined the Reichsmusikkammer and accepted the post of lecturer in theory in the Reichshochschule für Musik – but he made a deliberate point of going to see his old teacher Guido Adler, held under house arrest as a Jew until his death in 1941. After the War he was director of the music academy of the Salzburg Mozarteum (1946–47) before being nominated to a professorship at the Hochschule; his life from then until his death on 28 October 1959 was punctuated by a series of awards, honorary memberships and other distinctions. Kornauth wrote five Symphonic Suites, composed between 1913 and 1938, a handful of other works for orchestra and a body of piano music and songs. But the bulk of his catalogue is of chamber music, in a generous variety of combinations, including a Piano Quintet (1931), a String Sextet (1918–19), two String Quintets (1923 and 1932–37), a Nonet for flute, oboe, clarinet, horn and string quintet called simply Kammermusik (1924) and a Clarinet Quintet (1930) as well as number of other works featuring the clarinet. Kornauth’s publisher, Doblinger, lists his Op. 15 as ‘Sonate (Sonatine)’; The New Grove Dictionary opts for the diminutive without the option, and there’s certainly a sonatina quality to the work. But that may simply be a reflection of its very Viennese Gemütlichkeit; the score itself, published in 1917, the year after the work was written, proudly states ‘SONATE’ with no hint of a qualification. The first movement, Tempo di Marcia, which sets off in the tonic D major, is largely predicated on the four-note leap-and downward-run figure with which the violin opens; the harmony modulates constantly, but usually only briefly – like his contemporaries Korngold and Josef Marx, the chromaticism does not preclude a strong sense of key. The second movement, marked Tempo di Valse lenta (the score appends a German translation to the Italian terms), is a flirtatious waltz sequence in A major, returning to D major for one of its episodes and venturing as far afield as A sharp major in the final bars. The good-natured molto mosso finale, back in D major, adapts the four-note figure from the first movement, putting it aside during a more thoughtful passage in E minor, before it returns to alternate with a scurrying triplet figure that turns the downward runs the other way up. The music seems to have slowed to a stop when a Tranquillo coda takes matters in hand for a moment of quiet reflection, soon abandoned when the scurrying triplets break through and bring the work to an easy-going close. The list of people Ernst Křenek met during the course of his life reads like a “Who’s Who” of twentieth-century cultural history: at the age of sixteen the talented young man, who was composing already at the age of six, enrolled in the Vienna Academy of Music to study with Franz Schreker, and followed him in 1920 to the Berlin College of Music where he met famous musicians such as Ferrucio Busoni, Hermann Scherchen, Artur Schnabel, and Eduard Erdmann. Already in 1921 Křenek began to experiment with atonality, travelled to Switzerland and France, met Rilke and Adorno, and occupied himself with neoclassicism, Stravinsky, and the works of the group Les Six around Jean Cocteau. In 1925 he became Paul Bekker’s assistant in Kassel, occupied himself with the music of Schubert, the Romantic period, and opera, and composed his opera Jonny spielt auf. In 1928 he returned to Vienna, made the acquaintance of Karl Kraus, and intensified his literary activities. In 1932, together with Alban Berg and others, he founded the musical journal Dreiundzwanzig, and began to compose twelve-tone music. Until the beginning of the war, he travelled through North Africa, Spain, and America. Following his emigration (1938), he drifted around the USA until 1947 as visiting lecturer and then settled in Los Angeles. During the 1950s he resumed his concert and lecture tours in Europe, from then on commuting between the two continents: Křenek gave courses at the Darmstädter Ferienkurse, did a lot of conducting, and occupied himself with electronic music as well as with the polyphony of the Middle Ages. In 1966 he moved to Palm Springs in sunny California, where he spent the autumn of his life and died on 22 December 1991. In 1992 he was buried in Vienna’s Central Cemetery. “The most productive of the important composers of our time is Křenek, who is best known to the general public as ‘Ernst Who?’” opined Glenn Gould in 1975 – a bon mot from a master pianist who for all that had Křenek’s Third Piano Sonata (1922) in his repertoire and played it on his last piano recital in 1964. Unlike many other shamefully neglected composers, Křenek was at least fortunate enough to have had one real success, the opera Jonny spielt auf, whose Leipzig premiere on 10 February 1927 created a scandal, particularly due to the use of jazz and everyday noises. The scandalous “jazz-opera” by “Ernst Who?” became one of the most frequently performed operas between the World Wars, even though Křenek had actually only imported the Dadaism of Les Six and the ballets of Erik Satie to Germany. The Nazis repaid him with incessant persecution: in 1934 the premiere of his opera Karl V, a commission from the Vienna State Opera, was blocked; in 1938 he fled. To the present day, Křenek’s 242 numbered works do not receive the attention they deserve – the music of a composer, after all, who has to be considered the musical chronicler of practically the entire twentieth century, who explored the then current stylistic trends and attained in them a mastery similar to that of Igor Stravinsky, and who was also a strong personality and spoke with “his own voice.” To be sure, his death triggered a short-lived commemoration (documented by, among other things, a complete recording of his five symphonies), yet already his hundredth birthday was for the most part overlooked: “In Ernst Křenek Year there were no anniversary concert series in honor of the composer; major editorial efforts by the CD industry failed to materialize. A small, choice travelling exhibition crossed the country, a few concertante opera performances, a very few hardly publicized lectures – that was it,” noted Frank Hilberg bitterly in an article in Die Zeit. What could be the reason for this? It is to be feared that in the case of Křenek, too, the traditional aesthetic clichés have become entrenched: already in 1955 Hans Schnoor, in his popular Bertelsmann Concert Guide, described Křenek, with reference to the composer’s first autobiography Selbstdarstellung (1948), as an “eclectic, and this impression is confirmed by his scores, which started out with the atonality of the linear direction, temporarily strived for a neo-Romantic classicism, and ultimately led to the serial technique of twelvetone music. Today, the composer of Jonny champions the view that twelve-tone music will develop into a handicraft whose use will be taken for granted. This will presumably not be Křenek’s last position.” To the present day, little seems to have changed in this view of Křenek. The composer himself gave up all hope in 1985: “In the course of the past twenty years, I have often played with the idea that it should be possible to exist as a citizen of the world, as an Austrian and an American, yet this is certainly a chimare that does not stand up to the pressure of reality. The result is that one hovers between two continents or is caught between two stools, which ultimately may prove to be the only humane place.” Unfortunately, to the present day his music has fared no better, even if at least a few institutions took up the gauntlet for it during the composer’s lifetime: the Křenek Archive of the University of California in San Diego (founded in 1978) and the Vienna Library (1980). Fifteen years after his death, his estate found a home in the Ernst Křenek Institute, founded in 2004 in Krems, Lower Austria, his secondary place of residence. There, the staff has dedicated itself to the meritorious task of documenting his works and making them available to the public – including his largely forgotten literary oeuvre. With his First Violin Sonata, which was completed in 1920, Křenek made a significant contribution to the genre, even if he later – from a radically changed aesthetic viewpoint – distanced himself from it. It is entirely on a par with Erich Wolfgang Korngold’s Sonatas op. 6, written in 1913, Josef Marx’s Spring Sonata, and both of Ernst Toch’s Sonatas (op. 21, 1913, and op. 44, 1928). To be sure, it does not deny the hyper-Romantic, over-refined idiom of Křenek’s teacher, Franz Schreker, and is also openly oriented on Max Reger, whom Křenek respected highly throughout his life, but nevertheless has its own musical language. It is undoubtedly also necessary to understand the Sonata within the context of the works that Křenek wrote before and after it: the Piano Trio op. 1 (1910), the Piano Sonata op. 2 (1919), and the String Quartet No. 1, op. 6 (1921). During this period he audibly worked through the sonata form and the chamber music genres of the Romantic era. The Violin Sonata is in four movements, with an Adagio second movement. To be found in it, as earlier in the symphonies of Mahler, is a concentration of compositional structure (counterpoint; motivic work) as well as topoi typical of the time: a waltz-spirited, cantabile theme in the first movement; Wagnerianisms in the Adagio; a scherzo, which in its ironic Schubertian and Beethovenian echoes (“fate motif”) is almost reminiscent of Shostakovich, with a Brucknerian trio; and a Brahmsian variation finale on a Baroque-like theme. And yet while listening one senses that the accusation of eclecticism falls short: on the one hand, Křenek seems to be utterly absorbed in the late-Romantic idiom; on the other hand, he unmistakably creates distance by means of irony and refractions. His Violin Sonata appears to permanently mistrust itself, yet it is precisely from this ambiguity that it draws its originality and an explosive power that is topical even today.